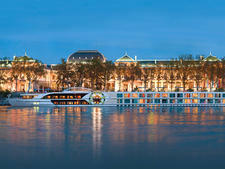 Tauck River Cruising's ms Savor is one of two new-builds introduced to the fleet of European vessels in 2014. 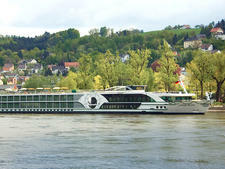 The vessel sails on the line's Rhine and Moselle itineraries. 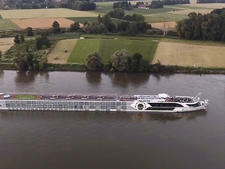 At 443 feet each, the Inspiration-class ships ms Savor and its identical sibling, ms Inspire, are 23 percent longer than Tauck's four Jewel-class vessels and will accommodate 130 passengers -- just 10 percent more than its current ships. 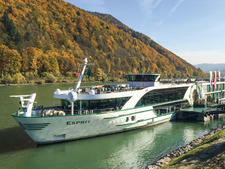 Ships of the same size operated by other lines carry up to 190 passengers. A new feature on ms Savor are "loft" design cabins, which have a raised platform seating area that provides extra space in lower level cabins. 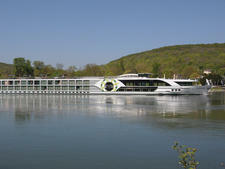 In total there are 67 cabins, and the line claims the ship offers more suites than any other European river vessel. The cabins -- 32 measuring 225 square feet, 13 from 150 to 190 square feet, and 22 suites measuring 300 square feet -- are located on three decks and are available in seven categories. Eight of the 32 standard-sized cabins are on the lower Emerald Deck and feature the "loft" design. Located against the ship's hull, each seating area will have a small table with two chairs, plus a raised ceiling that allows the use of a much taller window than can normally be incorporated into cabins on the lower deck. The upper portion of each window can be opened for fresh air. The 22 suites each have a pull-out sleeping couch to accommodate a third passenger, a walk-in closet, marble bath, his-and-hers double sinks, two French balconies with floor-to-ceiling windows and brocade upholstery. Standard cabin amenities include plush bedding with 100 percent goose down pillows, Molton Brown toiletries, in-room movies, minibars stocked with complimentary water and soft drinks, and air-conditioning. The main dining room on the Ruby Deck offers flexible dining times on an open-seating basis. An alternative casual dining venue, situated aft on the Diamond Deck, serves lighter breakfasts and classic favorites for lunch and dinner. There is also alfresco dining on the Sun Deck, weather permitting. Complimentary snacks are served from 10 a.m. to midnight, and breakfast room service is available in the suites. The Panorama Lounge and Bar is forward on the Diamond Deck. 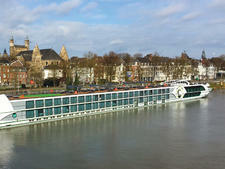 On the Sun Deck, there's a whirlpool and putting green, and the ship also has bicycles available for shore use. Other onboard amenities include a fitness room, spa, hair salon, complimentary Internet and an elevator. 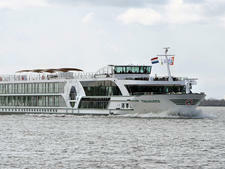 In addition to the crew of 39, the new vessels have a cruise director and three other Tauck directors onboard. They accompany shore excursions where passengers are divided into groups of no more than 25, with each group guided by a local expert. 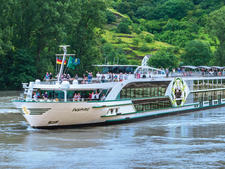 Tauck features all-inclusive fares that offer unlimited, complimentary beverages aboard the ship -- including regional wine, beer, premium spirits, speciality coffee, water and soft drinks -- excursions, airport transfers and all gratuities.